dissolves and removes other surface contamination as well! The Optimum FerreX Iron Remover will allow you to quickly and easily remove iron deposits from the surface! From your wheels, to painted surfaces, FerreX will bond to and dissolve iron metal and iron oxides from these surfaces. Simply spray on these surface and watch the iron contaminants wash away. Mist it on the paint, wait 5 minutes and wipe it with a damp sponge or skip the sponge and move on to a thorough rinsing. Upon completion you will be stunned at how much has been removed with so little effort. 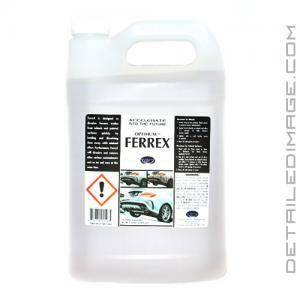 FerreX also dissolves and removes other surface contaminants such as tar and wax with minimal effort. Remove iron deposits and other contamination quickly and easily with the Optimum FerreX Iron Remover today! 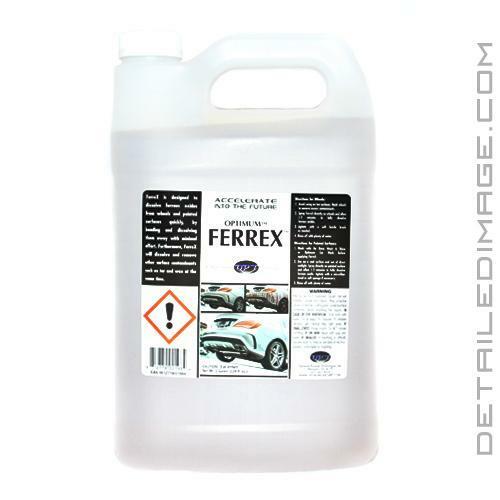 FerreX is designed to dissolve ferrous oxides from wheels and painted surfaces quickly, by bonding and dissolving them away with minimal effort, Furthermore, FerreX will dissolve and remove other surface contaminants such as tar and wax at the same. Avoid using on hot surfaces. Wash wheels to remove excess contaminants. Spray FerreX directly on wheels and allow 1-2 minutes to fully dissolve ferrous oxides. Agitate with a soft bristle brush as needed. Wash with No Rinse Wash & Shine or Optimum Car Wash before applying FerreX. Use on a cool surface and out of direct sunlight. Spray directly on painted surface and allow 1-2 minutes to fully dissolve ferrous oxide. Agitate with a microfiber towel or soft sponge if necessary. I bought this to compare with Ironx. It works equally well as Ironx. Ferrex also does the added job of removing tar which is nice. It does still have that infamous iron scent that smells terrible. I still find Ironx to work faster and stay wetter longer. I bought this to try an iron remover along side CarPro's IronX. I learned that a little goes a long way. It is expensive but it does help loosen the decontaminates before using my clay mitt. I sprayed, let sit, used the clay mitt to spread around and let sit for another few minutes. It worked as advertised. However when it came to heavily soiled wheels, IronX worked better. It would let me to believe that IronX is a little more potent. The purchase of this product was done with some scepticism. The price I believe is high for the size of the bottle. My truck is a 2004 Dodge Ram 1500 four door and the color is white. I wet down each panel individually sprayed one panel at a time. I could see the Optimum FerreX Iron Remover working as the instructions claim. The iron is being eaten by the color of the spray turning purple. A smoother feel of the finish remains. After the FerreX sits a few minutes I wash with a wool mit and Megs yellow off the shelf detergent. Thus far I have been able to treat my truck two times and my wife's gold colored Durango once. The bottle has about a quarter fluid remaining. Using Optimum FerreX Iron Remover, one must be sure to rinse thoroughly to remove the spray or you will have noticeable streaks on your finish. I would recommend this brand to anyone wishing to have a smoother feel after washing.